Practice your sharpshooting skills… with darts! 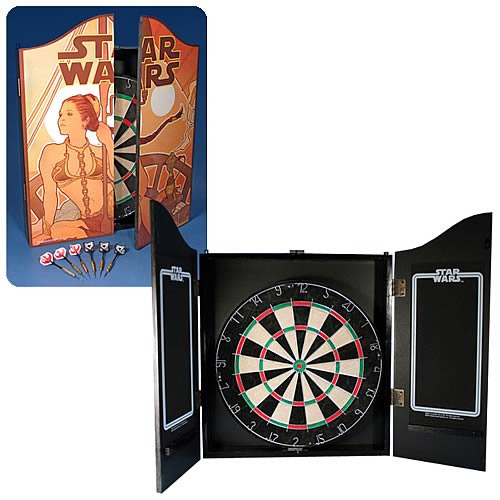 The Star Wars Dart Board and Case set is made of high-quality hardwood and features a tough Bristol target board with metal rims for accurate scoring, metal case hinges, and magnetic closure. Also included are 2 mounted chalk scoring tablets and 2 sets of printed flights for customizing your favorite darts! Silk screened with the work of comic book artist Adam Hughes' coveted, sold-out lithograph "Last Daughter Of Alderaan" from the 2006 Star Wars Celebration, it presents Leia in her famous metal bikini, clutching a vibro-ax in the desert sun. A truly magnificent work of art, this dart board measures 25-inches tall x 19-inches wide x 3 1/2-inches deep and when opened, stretches an impressive 39-inches across. The Rebels had nothing like this… but you can! Actual darts not included.